Italian Moms - Spreading their Art to Every Table: Classic Homestyle Italian Recipes is a Regional Italian Cookbook written by Elisa Costantini and her son, Frank Costantini, with photographs by Versano Photography. Elisa Costantini learned much of her skills in the kitchen while helping her Aunt Ida. She was the only one who was allowed to assist the secretive chef with the incredible dishes that earned her the status of a celebrated chef and caterer in Teramu, which is located in Abruzzo, Italy. Abruzzo, a mountainous region in Southern Italy, is known for its meat dishes, a basic meat sauce called Ragu, spreadable sausages, and mountain honey. Costantini interweaves the story of her childhood and early married life in Italy and later in the United States with her recipes. She begins with cooking tips and then presents a variety of regional antipasti. Her recipes are easy to follow and very well presented. Most call for a modest amount of ingredients and the cooking instructions are clearly described. The photographs of each dish will make most readers instantly start making cooking plans and compiling grocery lists for the recipes they’ll be unable to resist preparing. I've enjoyed trying new recipes for many years and, while my favorite chefs are Julia Child and James Beard, I've always had a soft spot for Italian dishes. 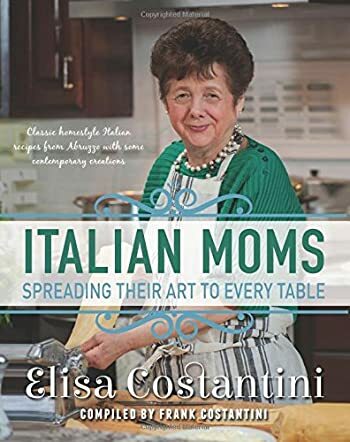 When I first saw Elisa and Frank Costantini's gorgeous regional Italian cookbook, Italian Moms - Spreading their Art to Every Table: Classic Homestyle Italian Recipes, I knew I was in for a treat. But I had no idea just how much of a treat this marvelous cookbook would be. I loved reading about Elisa's life and appreciated her descriptions of her first time making some of these special dishes. Her recipes are a dream to read, and I instantly started compiling an internal catalogue of the dishes I would have to try right away. There's so much in this book, from breads, to pastas, meat dishes, soups -- and desserts to die for -- but I have to admit my first project will have to be Costantini's Timballo, a massive dish that's similar to lasagna but is made with scrippelles, a type of Italian crepe, with, perhaps, tiramisu and Italian rum cake for dessert. Each of the dishes presented in this book speaks most eloquently of the love the authors have for their cuisine, and the recipes will be irresistible to anyone who enjoys cooking. Italian Moms - Spreading their Art to Every Table: Classic Homestyle Italian Recipes is most highly recommended. Italian Moms by Elisa Costantini is a collection of recipes compiled by her son, Frank Costantini. The project was one her son suggested and one she took up as a way to spend time with him. The root of this collection is her love for her late husband and her desire to be remembered through the recipes she’s fed her family for years. A few short stories about her life are included with different sections of recipes, from her connection to food to the root of why she started working with developmentally disabled children at Don Guanella’s. At the end is a handy list of traditional dinners and liquid measures, in U.S. and the metric system. Mouthwatering photos are included as a way of enticing the reader. Elisa Costantini is a delight. She made me want to be in the kitchen with her, listening to her tell these stories while teaching me how to cook. The recipes sound delicious. From ham and cheese Stromboli, to egg drop soup, to scrippelle mousse, to honey balls, everything made me want to be in the kitchen. There’s a recipe in here for everyone. Pastas. Breads. Meats. Desserts. This isn’t like other recipe books. I didn’t just feel a connection to food that sounded delicious, but to her. She’s relatable, kind, and I was in awe of her sense of purpose and hope. This isn’t just perfect for those who love to cook, but also for those just learning. Italian Moms is a must-have for the kitchen!